If you have ever wondered how mighty sailing ships turn, you probably thought it had to do with a rudder. And, you would be right! But, the ability to move that big rudder takes a lot of energy. Engineers came up with the idea that if you put a miniature rudder (a trim tab) on the big rudder, it would move more easily and use far less effort. And, in fact, it did! The trim tab was a brilliant technological innovation, but Fuller expanded the trim tab concept further, using it as an explanation of our place in the world. 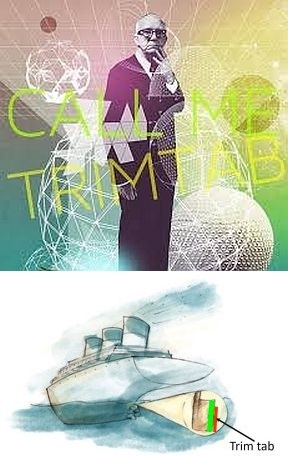 We are all trim tabs! We may seem miniature or ineffective at making big changes in the world, but the big changes have never come about without the individual change, first. Think about it. Men didn’t just decide one day that women should have the vote because it was the fair and equitable thing to do. It was a slow process of education and evolution by many activists that brought about the 19th amendment to the US Constitution in 1920 which gave women in America the right to vote. The airplane didn’t just happen, either. Man pondered the possibility of flight by watching birds, exploring the invention of the kite by the Chinese in 400 BC, and finally experienced it with the Wright Brothers first successful airplane flight in 1903. There were many people nurturing and giving fuel to these landmark changes – there were a lot of trim tabs helping to make these paradigm shifts possible. We have the mission and the means to heal our world. We don’t have to take giant steps to make a difference, just work at the trim tab level of the relationship or situation that is right in front of you now. The willingness for healing and peace to be the outcome in one relationship or situation makes a mighty difference in this world. One person can make a difference especially when they share the power of the Infinite, the power of God in doing so. And that is the purpose when forgiveness is the goal. Let’s join together as mighty trim tabs of healing today. Let us look at the problems that may be confronting us or the world today and allow forgiveness to rest its healing blessing on them. We can indeed be healed today. We can escape from a world of pain and suffering, for it is God’s will that we be healed and the means occurs as we release everyone with us through the power of forgiveness. What a mighty purpose we have!